As of now the Melee Section is Complete. I've yanked out all off the Building (and most of the obstacle) rules from the Shooting and Melee sections and gathered them into their own "Advanced Rules" section for now. I've also done all of the reformatting that action subsequently required to the Movement and Melee sections, and am still working on the reformatting of the Shooting Section. plus a few tweaks here and there. The most important thing right now is to show you all the revamped portion of the Melee section for feedback. 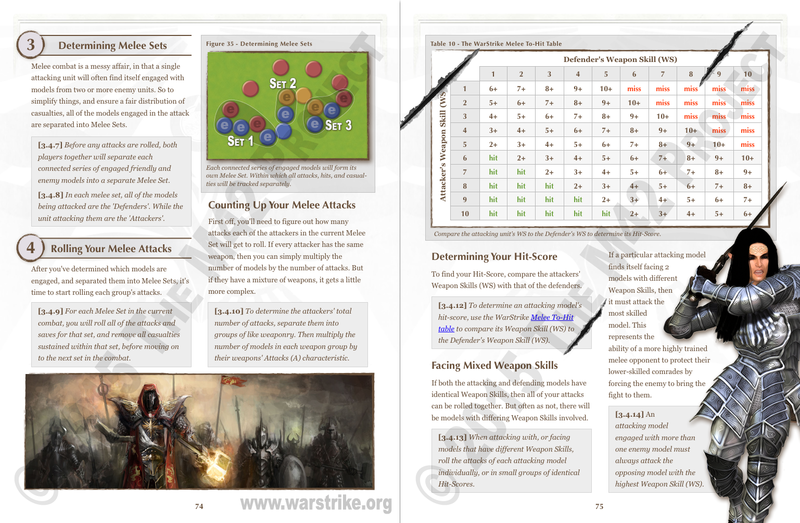 Since I changed around some terminology to make the rules (hopefully) easier to grok during combat. Instead of "Melee Groups", there are now "Melee Sets". Within which may exist different "AV Groups". The attacker and defender are also better defined in the context of a Melee Set so that the rules don't have to be quite so wordy. I have 6 pages to show, and I know from experience that it's generally better to feed them out slowly. So here's the first 2. Please have a careful look for anything that I might have missed!